For thousands of African-Americans who suffer from sickle cell disease and life-threatening blood cancers, finding a matching bone marrow donor can be a matter of life and death. Unfortunately, African-Americans have the lowest odds of finding a match than any other racial and ethnic group. Be The Match – the nonprofit charged with operating the national registry of volunteer marrow donors and matching them with patients – partnered with Padilla to raise awareness about this critical need during July, which is African-American Bone Marrow Awareness Month. Padilla and Be The Match launched “It’s On You,” a month-long awareness campaign and powerful call-to-action to people in the African-American community to step up and save lives. Four out of five households no longer fit the mom/dad-married-with-kids mold. Today’s families come in many shapes and sizes and are caught between their unique needs and current financial realities. In fact, 76 percent of modern families fear they will run out of money in retirement. That startling revelation was just one of several news-making statistics that emerged from the LoveFamilyMoney study conducted by Allianz of America (Allianz) to answer the central question: How does America’s evolving family structure change people’s relationship with money and financial planning? Allianz and Padilla dissected results of the massive 4,500-person study into key insights about the changing financial realities of the American family, and rolled out the revelations in phased, multi-media releases. The team carefully targeted top-tier media with the sequential news “nuggets,” each with engaging, easy-to-use infographics, and accompanied by social and digital content. The subsequent information was released in seven waves (the last in March 2015) and leveraged digital, social and traditional media channels to establish Allianz’s position as an innovative thought leader and market expert on the financial challenges faced by today’s American families. Padilla was also a proud sponsor of the PR Education Program of the Year. Padilla managing director Greg Tarmin presented the award to Syracuse University’s Job Ready Day One program. 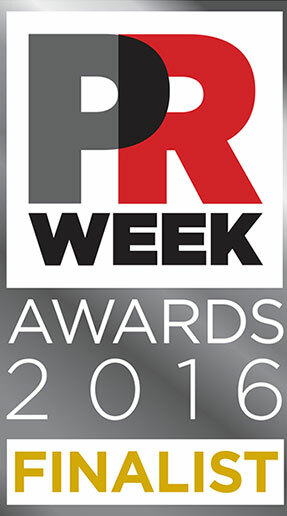 The PRWeek Awards 2016 took place on Thursday, March 17 at Cipriani Wall Street, New York. Read more at prweek.com and take a peek at the black tie affair here.